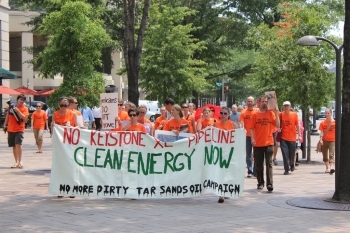 NORTH AMERICA: Keystone XL: A Pipeline to Europe? UXBRIDGE, Canada, Aug 23 2011 (IPS) - The promoters of Keystone XL, a huge new oil pipeline from northern Canada to the U.S. Gulf Coast, claim that it will reduce U.S. reliance on oil imports from unfriendly countries. The proposed pipeline could also be used to pump water from the Ogallala aquifer in the U.S. Midwest, one of the world’s largest, to the badly parched states in the arid southwest such as Texas, currently suffering its worst drought in history. Pipeline industry officials often say pipelines like Keystone can be easily used to transport water, said Maude Barlow, chairperson of the Council of Canadians, a large environmental NGO. Therefore, “Keystone XL poses a double threat to the Ogallala through contamination from a pipeline leak or by pumping water that is already being overdrawn,” Barlow said in an interview with Tierramérica. Spills from pipelines are not rare. Another Canadian pipeline company spilled 3.2 million litres of thick tar sands crude into a river in Michigan only a year ago, she noted. Despite massive clean-up efforts, U.S. Environmental Protection Agency (EPA) officials say it may be years before the work in the Kalamazoo River watershed is completed, largely because the heavy tar sands crude, called bitumen, is heavier than water and contains more heavy metals. Keystone 1, a smaller pipeline owned by TransCanada, the same 40-billion-dollar company that wants to build Keystone XL, has recorded 12 spills in its first year of operation, according to Friends of the Earth. The latest was last May in North Dakota, involving some 80,000 litres of tar sands crude. TransCanada now wants to spend seven billion dollars to build the Keystone XL pipeline, which would stretch 2,700 km south from Canada’s tar sands in northern Alberta through the American heartland, including the Ogallala aquifer in Nebraska, to refineries in Oklahoma and Texas, according to the U.S. State Department. The pipeline would carry 700,000 to 800,000 barrels of tarry, unrefined oil every day. There are an estimated 300 billion barrels of recoverable oil in the tar sands. The energy-intensive and polluting oil extraction and oil processing needed for tar sands oil makes it the world’s most environmentally damaging oil, say critics. “Keystone XL is really all about exporting diesel made from tar sands crude to Europe,” said Brant Olsen, energy campaigner for the Rainforest Action Network in San Francisco. Oil demand in the U.S. is dropping, and yet refineries on the Gulf Coast that specialise in refining heavy crude like that from the tar sands are expanding their capacity to process more, Olsen told Tierramérica. Valero Energy Corporation, a major refiner, say they need tar sands crude since imports of heavy crude from Venezuela and Mexico are declining, he said. The U.S. Energy Information Administration shows there is surplus pipeline capacity in the U.S., says Ryan Salmon, energy policy advisor of the National Wildlife Federation. The Keystone 1 and the Alberta Clipper pipelines were just completed and the data shows there is not enough tar sands oil production to fill those and other existing pipelines for another 10 years, Salmon told TA. “Keystone XL is a bullet line to the Gulf Coast. It’s going to take the Midwest’s existing supply and export it overseas,” says Salmon. In an aggressive media campaign, TransCanada consistently repeats that Keystone is all about increasing U.S. energy security versus “continuing to import unstable, higher priced crude oil from the Middle East and Venezuela.” When Tierramérica asked TransCanada about the potential for exports, they did not respond before deadline. “If you connect the dots, it points to exports. Americans don’t know this yet,” said Olsen. Europe is the major market for diesel, since most cars and trucks there run on diesel. However, there are no oil pipelines to either of Canada’s coasts, so it gets little if any tar sands oil. And yet a European proposal to label and put a penalty on tar sands diesel as “dirty” because of its high carbon content provoked a huge outcry by the Canadian government and the oil industry in 2010. Nearly all of the world’s largest oil companies have a stake in the tar sands, including Britain’s BP, Norway’s Statoil, France’s Total and Dutch-based Shell, among others. A massive lobby effort and PR campaign is ongoing in Europe as well as in the U.S. involving high-level Canadian government officials, says Olsen. Canada’s Natural Resources Minister Joe Oliver was in the White House in July telling the Obama administration that Keystone XL could deliver 30 million barrels of oil a month to the U.S., about the same as was needed to fill a shortfall due to the conflict in Libya. “Oil is a global commodity. The only way to improve U.S. energy security is to use less energy and reduce imports from anywhere,” stressed Olsen. The U.S. State Department is charged with approving Keystone XL and is expected to release its final environmental impact statement (EIS) by the end of the month. That too has been controversial. The consultant doing the EIS on behalf of the State Department has TransCanada as its biggest client, says Salmon. Moreover, TransCanada’s chief Washington lobbyist was the national deputy director of Secretary of State Hillary Clinton’s 2008 presidential campaign. A second round of public hearings will be held in September, with the final decision expected before the end of the year. On Saturday Aug. 20, U.S. environmentalists launched two weeks of civil disobedience actions against the pipeline, including sit-ins outside the White House gates. Keystone XL puts the U.S. State Department in strange position, Salmon said. It is working hard to negotiate a new global treaty to curb climate change while it may approve a pipeline guaranteed to increase emissions that make climate change worse.